“Create an oil painting for the opening of the new play Hungry Woman at Casa 0101 in Boyle Heights”—that was the invitation from curator Margaret Garcia. Other invited artists chose the Woman part of the title for inspiration. I picked Hungry, and knew that dessert was the direction I had to go in. Paid a visit to several of my favorite bakeries (I know, it’s a dirty job…), but nothing inspired me. 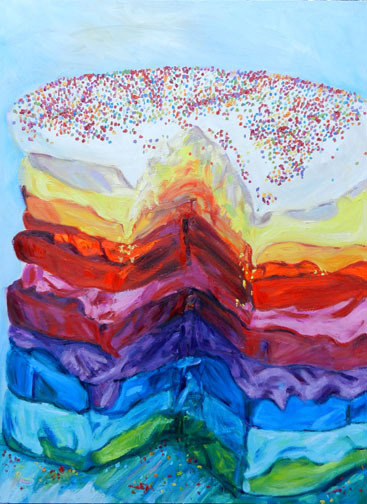 Then Lynnda, another RockPaperPaint artist, showed me a photo of a rainbow cake. Mmmmm…rich, creamy frosting oozing over multiple layers of buttery cake—all in bright sunset colors! Bingo. Hungry Woman runs Fridays and Saturdays at 8 pm and Sundays at 5pm through June 30. I saw the play—loved it! So did the LA Times. Catch the production if you can and enjoy the art exhibit too! Lucious! someone is going to snap this up.